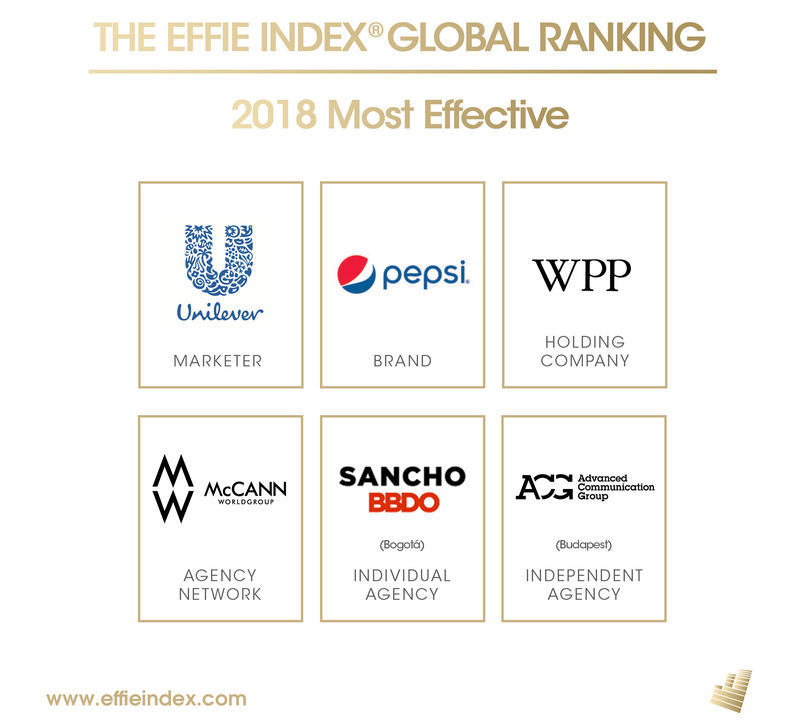 New York (May 24, 2018)— Effie Worldwide announced today the most effective marketers in the world, based on the global results of the 2018 Effie Effectiveness Index. Unilever, Pepsi, WPP Group, McCann Worldgroup, Sancho BBDO and ACG Advertising Agency hold the top global rankings in the categories of Most Effective Marketer, Brand, Agency Holding Group, Agency Network, Agency Office and Independent Agency, respectively. Since 1968, the Effie Awards have honored ideas that work. Unilever retained its title as the most effective marketer, the fifth time since 2011 that it has held the top spot. PepsiCo, fueled by a strong showing in Latin America, moved up three spots as the second most effective marketer. Nestlé moved to third, while The Coca-Cola Company retained its fourth-place ranking. Mars broke into the top five for the first time, based on successes in North America and Asia Pacific. Global FMCG companies continue to dominate the most effective marketer ranking. Procter & Gamble ranked sixth – falling out of the top five for the first time since 2011. Global brewers AB InBev and Heineken, along with McDonald’s and mobile phone leader Vodafone round out the top 10. Pepsi moved up three spots, replacing Vodafone as the most effective brand. Consistently ranked in the top five since 2011, this is the first time that Pepsi holds first place. McDonald’s jumped up to number two, while Coca-Cola slid to third. Vodafone ranks fourth, with Spanish telecommunications company, Movistar, completing the top five. A diverse range of industry sectors continue to populate the top 10, including technology giant IBM, along with Chevrolet, MasterCard and fast food leaders KFC and Burger King. Burger King shares the 10th spot with two Colombian beverage brands – Poker from Bavaria Brewery and Sr. Toronjo from Postobón. The top five most effective holding groups remain unchanged from 2017. WPP Group has remained the most effective holding company for the seventh consecutive year, followed by Omnicom, IPG, Publicis Groupe and Dentsu, respectively. McCann Worldgroup unseated BBDO as the most effective agency network. Consistently ranked in the top five since 2011, this the first time that McCann has topped the ranking. BBDO dropped to second, followed by Ogilvy, DDB and OMD (the first time a media network has appeared in the top five globally). Sancho BBDO (Bogotá) retained its title as the most effective individual agency office, given its success with brands like Visa, Sr. Toronjo and Winny, among other regional and global brands. McCann Worldgroup’s FP7/DXB (Dubai) moved up one spot to number two followed by MullenLowe Lintas (Mumbai). OMD (Bogotá) returned to the top five for the first time since 2013, ranking fourth, while Ogilvy & Mather (Mumbai) rounded out the top five. The top 20 effective agency offices feature a globally diverse mix of agencies from Argentina, Australia, Brazil, Colombia, Egypt, Hungary, India, Israel, New Zealand, Peru, Turkey, UAE, and the United States. For the third year in a row, Budapest-based ACG Advertising Agency retained its title as the most effective independent agency. Madre Buenos Aires moved up three spots to rank second, followed by Kiev-based Kinograf and MINT MENA from Dubai. A second independent agency from Ukraine, Banda Agency (Kiev), rounds out the top five. Now in its eighth year, the Effie Index recognizes the companies that create the most effective marketing communications ideas from around the world, determined by their cumulative success in more than forty-five national, regional and multi-national Effie Awards competitions. The 2018 Effie Index is compiled from 3,476 finalists and winning entries from worldwide Effie Awards competitions between January 1, 2017 and December 31, 2017. Information about how the rankings are compiled can be found here. Every brand and company ranked in the Effie Index has undergone rigorous evaluations of their case studies and work by expert industry judges to prove that their marketing achieved compelling results. Charts and graphics for the 2018 Global Effie Index are available for download. Effie Worldwide is a 501 (c)(3) nonprofit organization that stands for effectiveness in marketing communications, spotlighting marketing ideas that work and encouraging thoughtful dialogue about the drivers of marketing effectiveness. The Effie network works with some of the top research and media organizations worldwide to bring its audience relevant and first-class insights into effective marketing strategy. The Effie Awards are known by advertisers and agencies globally as the pre-eminent award in the industry and recognize any and all forms of marketing communication that contribute to a brand's success. Since 1968, winning an Effie has become a global symbol of achievement. Today, Effie celebrates effectiveness worldwide with the Global Effie, regional Asia Pacific, European, Latin American, North American and Middle East / North African Effie programs and more than 40 national Effie programs. For more details, visit www.effie.org.